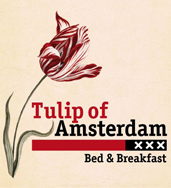 Please note that Tulip of Amsterdam B&B is strictly non-smoking throughout – This includes all rooms and the patio. We kindly ask guests to smoke in front of the house. In the event you or any member of your party smoke in your room or in the B&B we reserve the right to charge you EUR 150 for specialist cleaning to make the room fit as a non-smoking environment. Guests are requested to conduct themselves appropriately at all times and to comply with B&B`s procedures and/or requests with regard to conduct and respect for other guests, the property of the B&B, its employees and their health and safety. We respectfully ask that guests do not disrupt the comfort and enjoyment of other guests, the smooth running of the B&B, or cause offence to other guests or our members of staff. Conduct/behaviour that we reasonably consider inappropriate/unacceptable includes but is not limited to: creating an inappropriate level of noise and/or drunken or unruly behaviour and/or allowing unregistered persons to enter the B&B and/or any behaviour which other guests or staff find offensive in any way. We reserve the right to refuse accommodation or services or remove you and members of your party from the B&B if, in our reasonable opinion, we consider this provision to have been breached. Where this is the case we shall have no obligation to refund you for lost accommodation, other services or any other loss or expense incurred. We respectfully remind you that any items brought into the B&B, are brought in at your own risk. Tulip of Amsterdam B&B shall not be held responsible for the damage or loss of any property owned by the guest. For your convenience, valuable items can be deposited for the duration of your stay. Please contact us for more information. You should use your own insurance policies to claim the full amount of any loss or damage to your property prior to approaching Tulip of Amsterdam B&B. Tulip of Amsterdam B&B accepts no liability and will not pay any compensation where the performance of its obligations is prevented or affected directly or indirectly by or as a result of force majeure or any circumstances beyond its reasonable control including, but not limited to, flood, earthquake, extreme adverse weather conditions, natural disasters, other acts of God, acts of terrorism, fire or failure of electric power, gas, water, or other utility service, plant machinery, computers, vehicles or any collapse of building structures. The guest is responsible for any damage caused by any member of his/her party, whether in the hired rooms or in any part of the B&B and shall pay for such damage or loss of business caused as a result. All items and furniture in your room is the property of the B&B. We therefore reserve the right to charge you for the full replacement cost for any item or piece of furniture removed from your room. If you, or any member of your party, damage any bedding or linen, we reserve the right to charge you for specialist cleaning. Lost keys will result in a charge for replacement keys being levied.